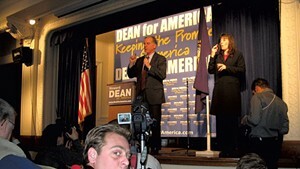 And Howard Dean [left], chairman of the Democratic National Committee, admitted it, too! The setting was Waterbury radio station WDEV's "Mark Johnson Show" on Tuesday. Former State Rep. Peter Mallary was the fill-in host. His old pal Howard Brush Dean III was his "special guest" via telephone. Yours truly wrote it up in today's "Inside Track" print column.